With the anniversary of Michael Jordan's "Flu Game" approaching, here's a look at what sneakers MJ was wearing for various milestones throughout his career. Nobody wants the flu, but Michael Jordan fans sure do love a flu game. As we hit the anniversary of Michael Jordan’s “flu game” during the 1997 NBA Finals, we look not only at the iconic moments that defined MJ’s career, but also the sneakers he wore while making those moments. After all, with Jordan Brand giving us a retro version of the Air Jordan 12 “Flu Game,” these sneaker moments can get recreated. ​The parquet floor of Boston Garden has played host to many a magical playoff moment. Michael Jordan added to the list in 1986 when facing off against the Larry Bird-led Celtics. MJ scored 63 points, albeit in a loss, but still, 63 points. The showing gave this rising star a true defining moment. Sneaker: The classic game has a classic sneaker to match. MJ, while donning the red away uniform of the Bulls, wore the Air Jordan 1 in the traditional Chicago Bulls colorway of white and red with a touch of black (the swoosh, for one). ​Michael Jordan vs. Dominique Wilkins was a slam-dunk showdown like none other in 1988. But it was a show stopped by MJ when he scored a perfect 50 on the final dunk of the night to edge Wilkins for the title. Of course, leaping from the free throw line can help up your score, especially in front of the home crowd on your own floor. 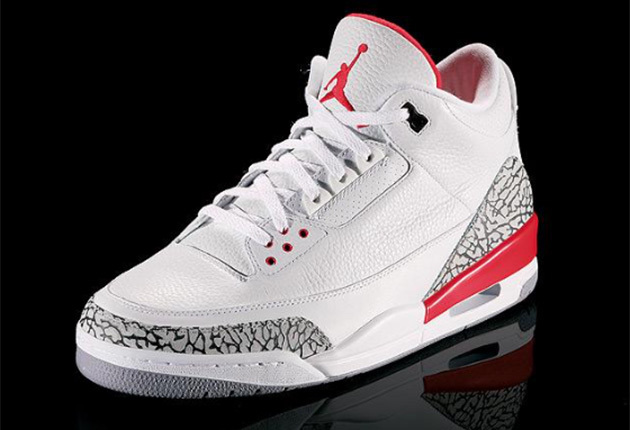 Sneaker: Maybe it was the dunk that vaulted the Air Jordan III to such pristine status, but whatever the case, the mostly white AJ III sneakers worn by MJ features the gray/black elephant print that designer Tinker Hatfield introduced on the AJ III. That elephant print has lived on as a Jordan signature ever since. You might refer to it as The Shot. You know, the one where Jordan hits a game-winner and series-winner with seconds remaining to advance the Bulls in the 1989 playoffs. The one where Jordan jumps into the air with a massive fist pump as Cleveland’s Craig Ehlo melts away in the background. That’s the shot. Sneaker: Again wearing the all-red Bulls uniform, Jordan paired the red of the jersey and shorts with the black of the Air Jordan IV. 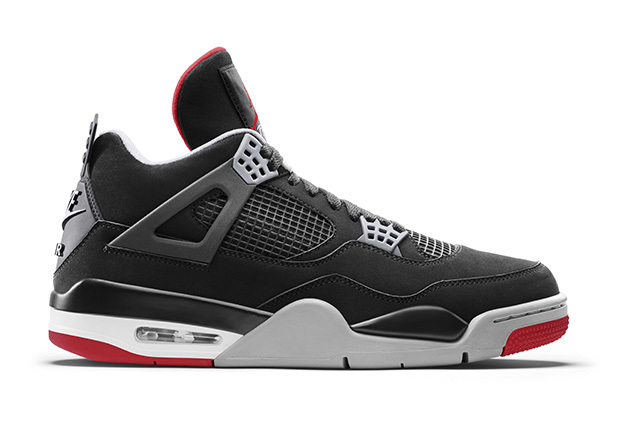 The AJ IV had slight touches of red and white, but black dominated the look (except for the white socks, of course). Michael Jordan likes to win. And he likes to win in Cleveland. He ensured he won in style in 1990, scoring a career-high 69 points in a 117-113 victory. Jordan took over the game in Cleveland, grabbing 18 rebounds in the process of wowing fans with his point-pouring prowess. 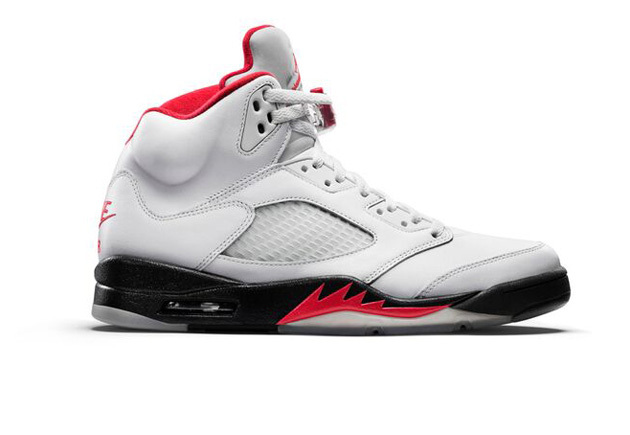 Sneaker: Again wearing the road red, MJ opted for the largely white version of the Air Jordan V. With hints of black for the sole and “fire red” for design elements on the sole and collar, the AJV started in 1990 and enjoyed a first stretch of fame with MJ’s career-high game. When Michael Jordan jumped, the ball was in his right hand. While in the air, MJ switched it to his left and then deftly scored, a key moment in the 1991 NBA Finals against the Los Angeles Lakers. The Game 2 play helped lead the Bulls to a victory and eventually an NBA title. Sneaker: While this time in the all-white Bulls uniform, Jordan kept his sneakers largely black. 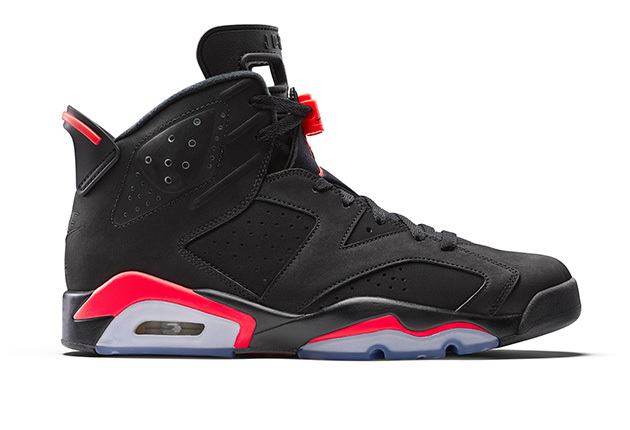 The Air Jordan VI—now known as the Infrared—was nearly solid black, but included hits of red and white around the visible air pocket. A red toggle adds a nice touch. Every Portland fan knows this story far too well. During Game 1 of the 1992 NBA Finals, Michael Jordan simply went off from beyond the 3-point line while scoring 39 points, largely due to six triples in the first half (Portland could have at least gotten a hand up!). During the scoring barrage, MJ hit a three and gave his famous shrug as he fell back on defense. Sneaker: Wearing the home whites in Chicago, MJ again went with a mainly black sneaker. 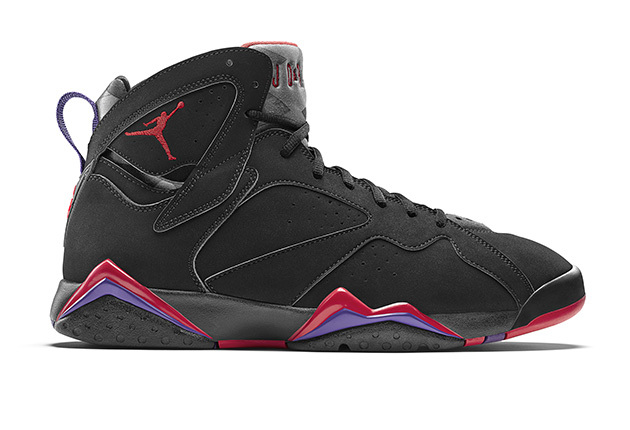 The Air Jordan VII black/true red features differing shades of black and slight touches of red, including on the Jumpman logo on the side. The AJ VII, with its legendary Hare Jordan colorway, has had varrying iterations over the years, but MJ wore one of the simplest designs when pouncing on Portland. Just five games into the Jordan return, MJ showed us all why we were glad to have him back on the hardwood in 1995: he scored 55 points—his double-nickel game—in Madison Square Garden against the New York Knicks, all wearing his new number 45. 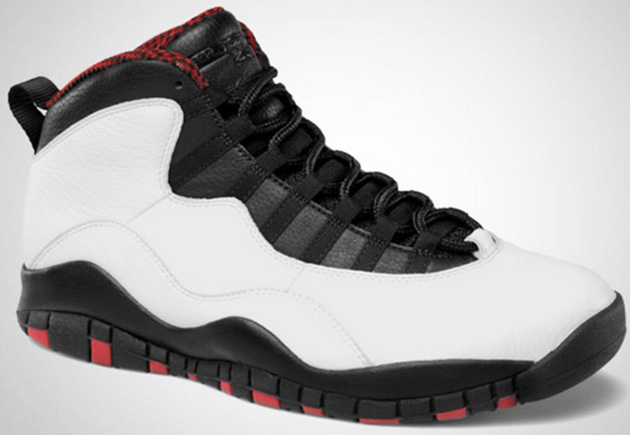 Sneaker: MJ gave us all a reason to love the Air Jordan X, since he brought it to the hardwood. In New York, wearing the away red, MJ opted for the largely white AJX, complete with a heavy dose of black and red accents. Maybe it was the then-record setting 72 wins in a season during Chicago’s 1995-1996 stretch. Or, more likely, it was the fact that the Bulls won a fourth Jordan-led NBA title in 1996 against Seattle—it was the first of the second Chicago three-peat. But no matter the enduring stat, the defining moment was when MJ clutched the NBA trophy on Father’s Day in 1996, dedicating the win to his own dad. Sneaker: In what would become one of the most famous AJ silhouettes, Jordan wore the Air Jordan XI on that Father’s Day. 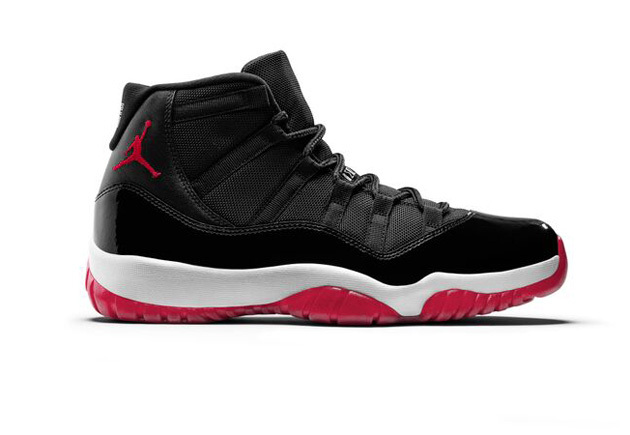 The red uniform of the Bulls was paired with the shiny black leather of the XI, complete with white accents and a red sole. It wasn’t a great night in Salt Lake City for Michael Jordan between games 4 and 5 of the 1997 NBA Finals. MJ woke up realizing he had some sort of stomach ailment. An off day, he stayed in bed for 24 hours, missing the team’s shoot around before Game 5 and arriving to the arena looking as sick as he felt. But amidst obvious sickness, he scored 17 points in the second quarter to pull the Bulls back from a deficit and made game-saving buckets in the fourth quarter as he scored 38 points in the win before collapsing at the end. 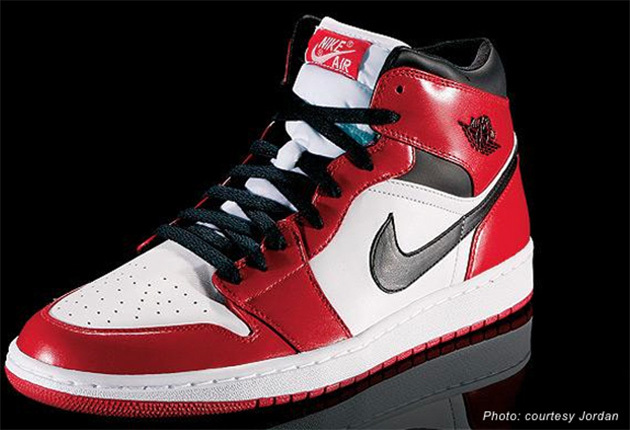 Sneaker: Barely able to put on the all-red Chicago uniform, MJ again wore a black-based sneaker. 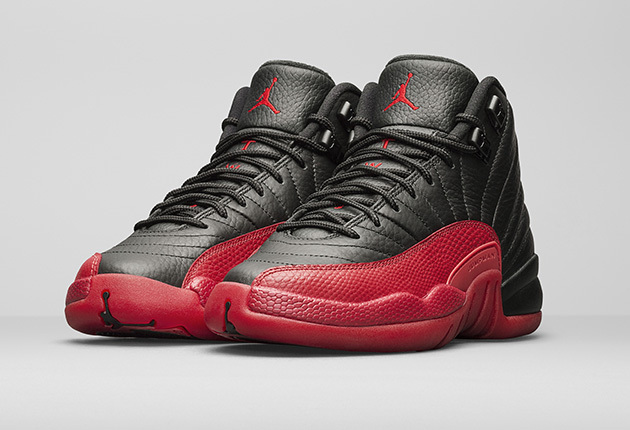 But this, the Air Jordan XII, has plenty of red to go with. The upper includes all black, but changes to red well before underfoot, giving a distinct black/red look to the clean design. In Michael Jordan’s final shot as a Chicago Bulls player, he hit a 1998 NBA Finals-winning jumper over Byron Russell to clinch his sixth NBA title. With the Bulls leading the series 3-2, Utah controlled much of the game, but Jordan scored 45 in the game, including the final shot that came after a steal, giving MJ a send-off moment like no other. Sneaker: Wearing red in Salt Lake City, MJ again chose black sneakers. In the Air Jordan XIV—the one with the racecar-inspired design—Jordan’s traction was perfect while Russell slipped to the floor. 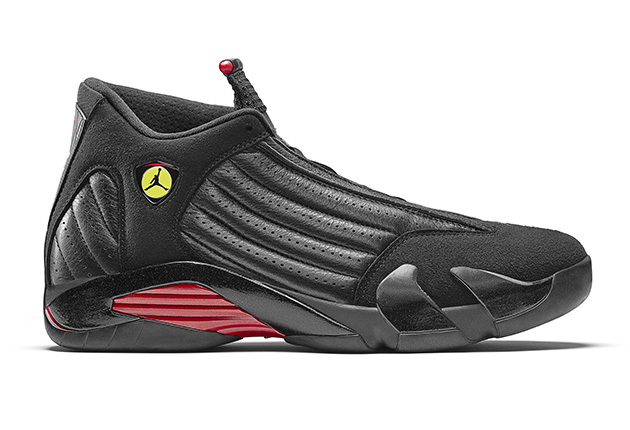 Only a few touches of red and the small yellow-backed Jumpman logo on the side break up the suede and leather black. For the 15th time in his career Michael Jordan suited up for an All-Star Game. It was his last. After missing his first seven shots, MJ got going and eventually nailed a fadeaway jumper from the right corner with five seconds left in overtime for a lead for the East. But instead of the game ending with Jordan’s final shot, Kobe Bryant—wearing old-school Air Jordans—was fouled and then sent the game to a second overtime. The West won it there. Jordan still finished with 20 points, a farewell to the All Star Weekend. Sneaker: Playing as a Washington Wizard, long gone were the black and red sneakers Jordan’s most iconic moments gave us. 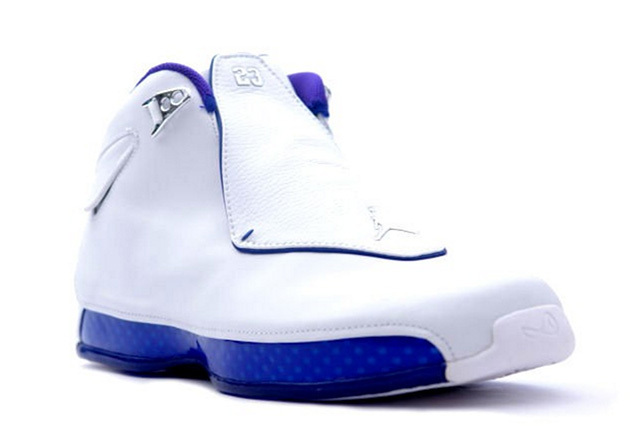 Instead, the Jordan XVIII worn that day featured a classy white with plenty of blue on the sole and atop the collar.